Southern Guangzhou International hotel supplies wholesale Market from Guangzhou south building and development companies to invest large square over two hundred million yuan in 1999 built the city of Guangzhou in southern China as well as the largest wholesale market. Market by the municipal and district levels of government approved the project, the Urban Planning Bureau, the Land and Housing Board for approval to be built, after the acceptance of Guangzhou City Fire Department, Guangzhou south building of the international hotel supplies wholesale professional market, the Government awarded the construction award. In 2002 the Government issued the advanced private enterprise award. Guangdong Province in 2006 was the competitiveness of commodity trading market top fifty. 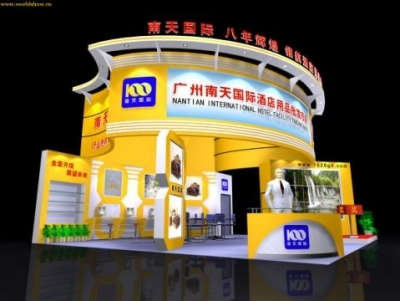 Guangzhou International hotel supplies wholesale south area of ​​more than 20 million square meters, built shops 1500, supporting 30,000 square meters of warehouse, 15,000 square meters of covered car park, the venue has a business center, banks, freight etc. supporting services. Shop for the concrete frame structure, standard commercial exhibition design, each floor area of ​​about 20m2, 5.2m height to fit customer needs for flexibility to expand business processing. Channel inside cover shed light modern arc arch to facilitate business operations around the clock. South-day international hotel supplies wholesale market has introduced 51 Road, 88 Road, 188 Road, Guangzhou City Road and other multi-channel bus. Southern Guangzhou International hotel supplies wholesale products are mainly engaged in wholesale: kitchen equipment, food machinery, baking equipment, buffet equipment, a variety of refrigeration equipment, ice machines, Chinese and Western dishes, ceramics, glassware, cleaning machines, cleaning supplies , room supplies, needle textile, towels, bedding and so on. Today's Southern Hotel supplies a collection of plants around the country, businesses, and the United States, Germany, France, South Korea, Japan and more than 20 countries, hotel supplies dealers set point operation, "credibility first, quality first" to take the good after-sales service, through radio, television, newspapers and other advertising, hotel supplies throughout the country to win the regional distribution and hotels, guesthouses, hotels, restaurants procurement staff's trust and love, every day purchases at the merchants of twenty-three million, product sales have been covering the whole country and exported to Southeast Asia and other places. To meet the opportunities brought by China's accession to WTO, south of Guangzhou International hotel supplies wholesale to prepare a comprehensive upgrade, will consolidate the existing business strengths with new ideas, to develop high and new technology to further expand their own development, to further accelerate with international standards, lay in the influence of China and even the world, for the industry to add more active elements.